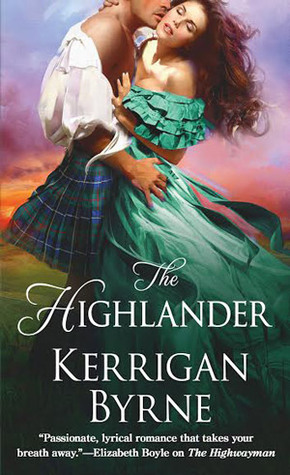 The Highlander is the third book in the “Victorian Rebels” series, following The Highwayman (reviewed here) and The Hunter (reviewed here). I found The Hunter a little too dark for my taste; how did The Highlander stack up? SPOILER WARNING: There will be some spoilers for the first two books in the series. THE PLOT: The last time we saw Lady Philomena St. Vincent, she was helping Christopher Argent save Millie LeCour from her husband’s family. Unfortunately, Millie is paying a high price for her kindness. She was already a battered wife; now she’s been dumped in an insane asylum and tortured. She’s rescued at almost the last moment by the people who owe her one. Millie and Farah Blackwell conspire to send Mena away to Scotland in disguise, to become the governess for Farah’s brother-in-law’s two children. Liam Mackenzie, Marquess Ravencroft, is better known as the Demon Highlander. The same man who fathered Dorian Blackwell warped his own legitimate heir as well, forcing him to whip women for fun. To his credit, Liam did NOT find it fun and did his best to save the women from his father. But he’s convinced that everyone who comes into contact with him is doomed. He’s immediately smitten with his children’s new governess, but he knows she’s hiding a big secret. Despite showing clear signs of abuse, Mena still manages to stand up to him. He doesn’t know it, but he’s captivated by all the things Mena’s husband hates about her. Anyway, despite the beginning (which features the whipping and then the asylum scene), this book is a lot lighter in tone than The Hunter. Liam may believe he’s beyond redemption, but he’s actually a good man. He’s got a bit of a rocky relationship with his teenage children, which is pretty normal. He has a very earthy lust for Mena, yet never hurts her. Mena’s character is a fine line between battered yet spunky. She’s emotionally frail, but still hasn’t given up on herself. And despite everything she’s been through, she can’t quite give up on love, either. I love the description of the Samhain festival. If you’re not familiar, Samhain is pronounced “SAH-win,” so don’t internally read it as “sam-HANE.” The celebration really makes Liam’s culture come to life and provides some neat details about pagan rituals. Also, it gives people the opportunity to behave badly. COVER NOTES: The previous two covers have been fairly monochromatic, so this one is a slight break in style, I’m assuming to play off the plaid. Mena is wearing the dress she wears to the Samhain celebration. I love when the cover actually reflects elements of the book. 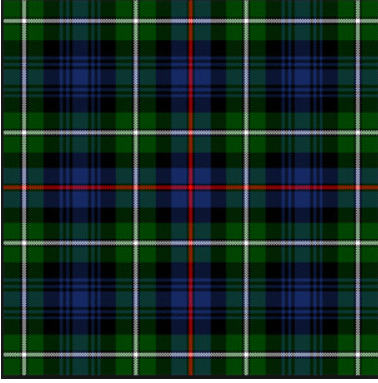 The author posted a photo of the Mackenzie plaid on her facebook page; what do you think, fairly good representation on the cover? BOTTOM LINE: This is one of those romances where you KNOW the couple will end up together, you just can’t imagine HOW. The majority of this book is lighter in tone than the previous book, but the opening scenes are still very dark like the rest of the series. WARNING: Like Elizabeth Hoyt, Kerrigan Byrne uses strong language and very graphic sensuality in her love scenes. ON SALE DATE: Available August 2, 2016, in paperback and eformats. NEXT UP IN THE SERIES: Book 4, The Duke, will be published February 7, 2017. I think the Duke of Trenwyth was just introduced in The Highlander; I don’t think we’d heard of him before…but I could be wrong. He’s lost a hand, so you know he comes with tons of juicy baggage.